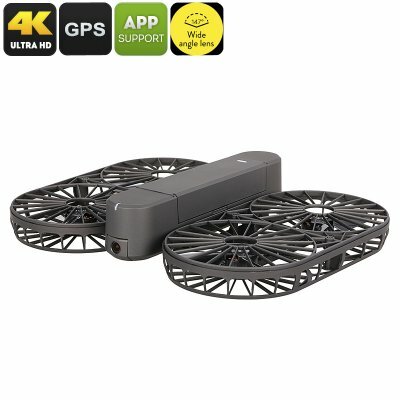 Successfully Added Simtoo Moment Airselfie Drone - Foldable, 13MP CMOS, 147-Degree FOV, 4K Video, GPS, App Control, 100m WiFi Range, Follow Me Mode to your Shopping Cart. The Simtoo Moment Airselfie Drone allows you to snap pictures and shoot video like never before. This light weight foldable drone features an intergraded 13MP camera. Thanks to its 1/2.5-Inch CMOS sensor, this piece of hardware lets you snap stunning 16MP photographs and 4K video. With its compact design, this video drone can be easily carried around anywhere you go. You’ll be able to snap stunning pictures and breathtaking footage of all your upcoming parties and holidays. Your selfie drone comes with a 2900mAh battery that lets you fly for up to 15 minutes in a row. Its stunning 13MP camera features a 174-degree FOV. This means that you’ll be able to capture wide-angle footage and never again miss out on a single detail. With its 4K resolution, you’re sure to be treated to mesmerizing images and vivid color. Your video drone features several intelligent flight modes that do not only increase your flight experience, but also make it easy to snap the perfect pictures. It furthermore supports 1-axis stabilization that easily allows you to aim your camera at the point of interest. Your selfie drone can be easily controlled via your smartphone. It supports a 100m WiFi range that brings along great usability. With 3m/s flight speeds and a 20m max height, this video drone allows you to discover your surroundings in up to no time. From now on, you’ll be able to snap stunning pictures from above and experience your neighborhood from a totally different perspective. Thanks to its compact size, this selfie drone is perfect for both indoor and outdoor flying. The Simtoo Moment Airselfie Drone comes with a 12 months warranty, brought to you by the leader in electronic devices as well as wholesale Quad-Copters..
Arabic: - ك 4 الفيديو بدون طيار - Chinese Simplified: - 4 K 视频无人机 - Czech: - 4K videa dron - Danish: - 4K Video Drone - Dutch: - 4K Video Drone - French: - Drone vidéo 4K - German: - 4K Video Drohne - Hebrew: - זמזום וידאו 4K - Hindi: - 4K वीडियो गबन - Italian: - Drone Video 4K - Japanese: - 4 K ビデオ無人探査機 - Korean: - 4 K 비디오 무인 항공기 - Malay: - Berdengung Video 4K - Norwegian Bokmål: - 4K Video Drone - Romanian: - Trântor pagina de 4K - Russian: - 4K видео Дрон - Spanish: - Drone vídeo de 4 K - Thai: - เสียงพึมพำวิดีโอ 4K - Turkish: - 4K Video casus uçak - Vietnamese: - Mục tiêu giả Video 4K. Nice Gadget! Perfect for a gift! How much is the extra battery?